For some reason, I have never seen this movie before, even if it was on TV countless times. I have to say that it is a great film. I enjoyed it more than I had anticipated. Great performances all around. Did you watch the extended cut? I always thought the added scenes helped make sense to some of the plot parts and just to the characters in general. Is the Director's Cut (only version I know) equal to the extended cut? Yes, I have watched the director's cut. As far as I know, the extended cut and the director's cut are the same. There is also a long version of the film, referred to as "international version" or "version intégrale". Containing 25 minutes of additional footage, it is sometimes called the "Director's Cut" but Besson refers to the original version as the Director's Cut and the new version as "The Long Version". I love Leon, I'm not sure if I saw the Extended cut or not but next to V for Vendetta it is my favourite Natalie Portman role. 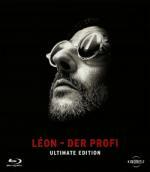 Leon is a great movie; I prefer the director's cut. I didn't much like V for Vendetta, I just couldn't get into it and I found it very predictable. Really? V for Vendetta is one of my all time favourites, as well as being one of my most watched films. I must have seen it at least 20 or more times (part of this was due to having to study it for VCE) but it's still one of my faves nonetheless. I've never seen such enthusiasm for this film! Tell me you've read the book, Sophie, it's so much better. Yes while I was studying it at school I brought the graphic novel to read and loved it. 'Enthusiasm' for the film is very much an understatement when it comes to me and V for Vendetta. Outright obsessed is a more accurate way of describing it! I once watched the whole film 6 times in one week. Something I have never even come close to doing with anything else. You had to study V for Vendetta for your VCE? No comment. As for most watched films, three come to mind. Chopper, The 'Burbs and A Nightmare On Elm Street 3: Dream Warriors. Yeah I had to study it for media. My teacher loved to makes us study some of his favourite films so throughout VCE media my class studied: Alien, The Elephant Man, V for Vendetta, Philadelphia, Pan's Labyrinth and The Blair Witch Project. I wish my media class was like. I did it in year 11 and we had to study The Castle, which was I was very pleased about. And another Aussie movie called Shame, which was totally and utterly pathetic. Did you have sort of Australian-only rule? Those are only the films I studied in media. I also studied The Heiress, Children of Men and a few other films I can't remember in other classes. Who knows, I gave up trying to figure out my school's logic. I could tell you some stories about that place.